Nervous but hopeful describes how I feel about tomorrow and my upcoming doctor’s appointment. Tomorrow morning I have to go have bloodwork drawn as my PCP told me back in August she wanted 3 month labs done. I am nervous because the last time I had bloodwork done was prior to surgery, and my a1c and triglyceride numbers were crazy high. Well, crazy high for me–my a1c was 7.5 and at the moment I don’t remember what my HDL:LDL ratio was but it wasn’t awesome. That I do remember.I am anxious to see what the effect of surgery is on my lab numbers. I am hopeful that my a1c is down since I have been eating 50 grams or less of carbohydrates daily for the past 4 months and I was advised to stop taking my metformin back in August. I worry about my cholesterol numbers though since my diet is mostly meat-based and I haven’t had room for veggies really. I guess I’ll have to wait until Wednesday, when my doctor and I will have the chance to review the lab results. I’ll also have the opportunity to step on her exam room scale for only the second time since I’ve been her patient (and I’ve been her patient for 15 years). Don’t know why, but this excites me quite a lot. I am nervous about what will happen with regards to the edema in my legs and feet. I am not sure if I should contact my surgeon or not about this issue. Something tells me I should since it has worsened post-op, but at the same time, what can he do about it? Best to see what PCP can do first. In other news, I got to wear a t-shirt to work in a size that I haven’t worn in nearly 20 years. This is also exciting. And the best part is that the shirt is a little loose so I have a feeling that in a few short weeks it may not fit properly! Perhaps I will end up being smaller than I thought. I did notice this morning when I turned to the side that my belly seemed flatter and less pointy. I guess I’ll have to wait and see what will happen. That seems to be par for the course these days–wait and see. Ate away from home for 2 of 3 meals today and didn’t do too badly. I stopped at Rudy’s this morning en route to school and had them make me a breakfast bowl instead of a breakfast taco–so I got a bowl loaded with eggs, ham, cheese and a little bacon on top. I ate a little less than half before I felt the pressure in my tummy and decided that was enough. Good stuff. I’m starting to really appreciate how well my restriction works now that I am able to eat more types of food. We went out to dinner tonight, which was the plan, and had decided to get the surf and turf plate at a restaurant that we frequented quite a lot prior to surgery. Hubby and I decided we’d split the plate since it made no sense for each of us to get a full plate. 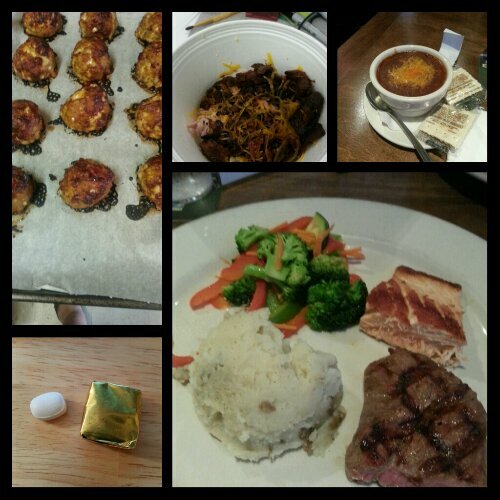 Dinner was quite good–half a salmon filet, plus half a sirloin filet, some mixed veggies and mashed potatoes. I also ate a couple of tablespoons of chili. In retrospect, all mixed veggies would have been better, but I didn’t eat too much of the mashed potatoes and stuck to the “protein first” rule since by the time I ate dinner I was low on protein for the day. I wasn’t able to eat the snack I’d packed myself earlier in the day which was why I was low, but I decided to eat the leftover steak as a snack before bed, which I did. Today’s food choices, from upper right: a little chili with cheese (didn’t eat the crackers, saving them for some almond butter later in the week); a surf and turf plate–salmon (ate all of that), sirloin steak (only ate a little less than half), a couple of pieces of broccoli and about 3 teaspoons of mashed potatoes; multivitamin and calcium supplements x2; cheesy barbecue turkey meatloaf mini with mashed potatoes and a couple of tablespoons of corn (not shown); Rudy’s breakfast bowl with eggs, ham, cheese and bacon. Still mulling over the support post in my head. It’ll come, I know. Maybe tomorrow while I’m out and about at the football game and tailgate. This entry was posted in daily bites, eating, NSV's, post-op, vsg, weight loss surgery and tagged daily bites, little celebrations, meal planning, NSVs, post-op eating, post-op life, VSG, vsg realness, WLS. Bookmark the permalink.